Raffa Nadal, always my hero. Seven years ago I was seriously ill in a Sydney Hospital with a hideous, undiagnosed condition. It was affecting my brain, my heart, my muscles…. and just about everything else. Part of my stabilizing medication was a very high dose of the steroid Prednisone. Among the side effects of this drug are the inability to sleep and a highly charged emotional state. All this was taking place during the 2012 Australian Open Tennis Championship. My hero Raffa Nadal was in the men’s final against Novak Djokovic. I made a ridiculous, mental bargain; ‘If you win Raffa, I’ll be alright’. Fortunately I had a private room and staff didn’t seem too concerned about my wakeful state. I was able to watch TV unhindered. At least it was a distraction and I suspect that’s what the medics thought. Well of course that famous match went on for five sets and lasted almost six hours. I’m sure I must have dozed off at some points, but mostly I was wide awake and incredibly stressed. I might even have cried at various, vital stages. In the end, around 1.30am, my lovely Raffa lost. Oh good grief I was devastated. Both men were totally spent, and I was too! Absolutely nothing left for Raffa and Novak.! And was I alright? Well no….I was finally diagnosed with a rare form of vasculitis; Churg Strauss Syndrome. Poor Raffa was to have more than his share of health problems as well, missing many tournaments through injury. On a positive note, after some pretty heavy treatment and heart surgery, seven years on I am celebrating five years in full remission. During those intervening years I published a couple of books and researched a third. I travelled widely, took up photography (in my own fashion) and started this website. Raffa managed to win many more tournaments and was always his gracious self, despite adversity. By a huge co-incidence I reached 250,000 visits to the website today. Time to get back to my unfinished biography. 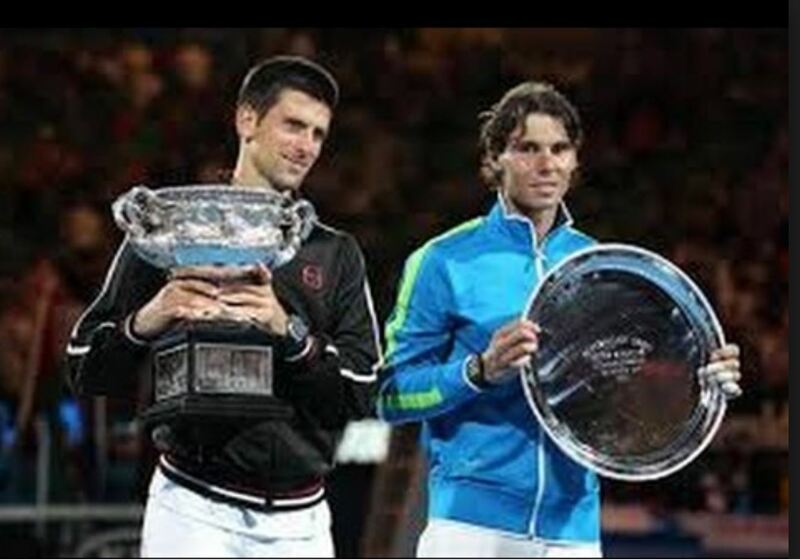 And incredibly, Raffa and Novak are meeting in another Australian Open final. It must be an omen! Public expectation is high that this will be another almighty battle. There is so much at stake, with both players closing in on Roger Federer’s amazing tally of Grand Slam wins. Well, we all know what happened. Novak triumphed over my lovely boy in three sets. He delivered a true master class and congratulations to him. A worthy winner over Raffa. Raffa will never give up. All being well he will compete at the French Open and Wimbledon. And moi? Well the chance of relapse is always present (there is currently no cure for Churg Strauss Syndrome), but at the moment I’m fine. You know what? I didn’t make any bargains with Raffa this time. I didn’t say, ‘If you win the final I will complete my biography of Victor Ratten.’ Theoretical bargains and dreams of fairytale endings are fine, but I do realize it’s up to me to take responsibility and put in the work. Thanks Raffa, you are still my hero, and an inspiration. Raffa Nadal. That’s my boy! You are truly inspirational Pauline! I love your blogs.I have never heard of Church Strauss Syndrome, but have experienced prednisone treatment. 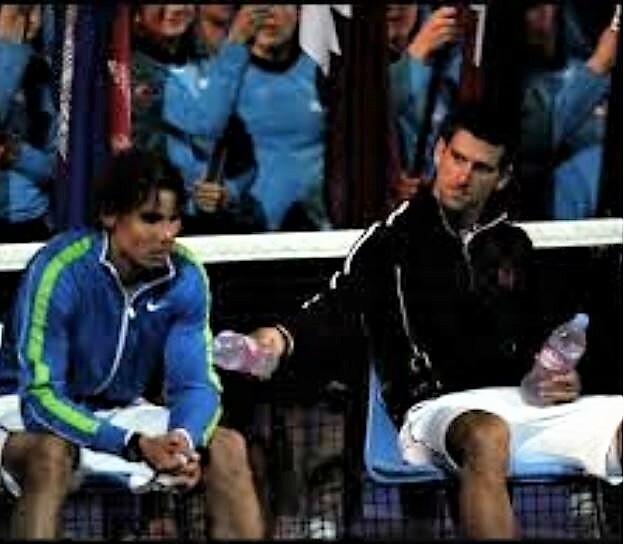 Praying you will keep up your amazing attitude, and that Rafa keeps us all enthralled. Thanks Pat. Oh dear, but I meant to write Churg Strauss Syndrome. The funny thing is we jokingly call it Church Mouse Syndrome because it keeps people poor paying for their medications! We call prednisone the Devil’s Tic-tacs. I’m not a tennis follower, but I do follow you, Pauline. You are certainly an inspiration. So glad all is well now. Thanks so much Carol. I’m certainly no inspiration though, just incredibly fortunate and appreciative of all life has to offer.